Continued growth for Edwards Transport has meant that they were in need of further warehouse space, fast! The solution? A brand new warehouse to be constructed and utilized as a chilled store. Quickline were brought in to maximise the space available by installing a narrow aisle racking layout to suit the clients’ turret fork lift trucks. 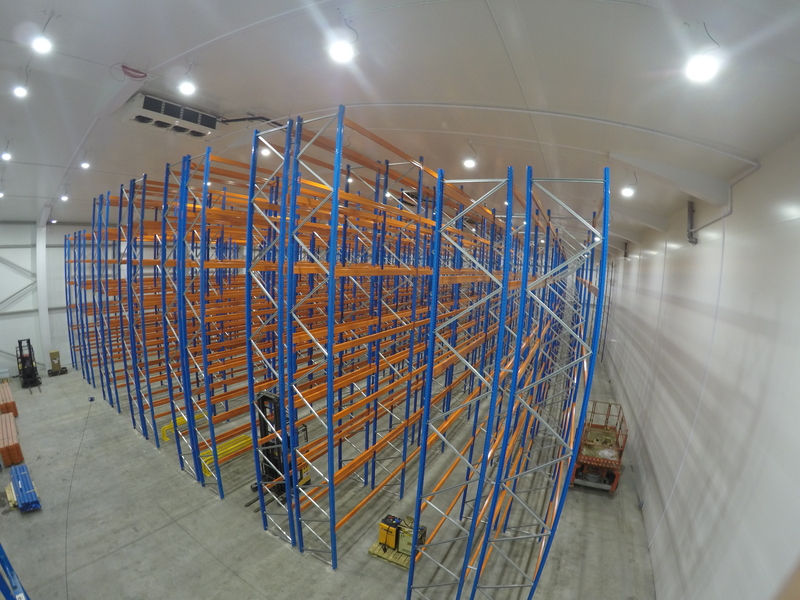 Utilizing the eaves height meant that 10m frames could be installed down the middle of the new warehouse, with slightly smaller 8.6m frames under the lower sections. The frames configured in the narrow aisle racking layout provide seven and six beam levels respectively resulting in over 3500 pallet spaces. The last bay at the bottom end of each run of the narrow aisle racking feature a walk through section to allow pedestrians access through the double runs in case of emergency. This is achieved by using a smaller beam at the first beam level and a stub frame. It is possible to comfortably pass between the main taller frame and stub frame safely, providing an evacuation route to the fire doors situated at either end of the back wall of the warehouse. Once the wire guidance system was installed, the narrow aisle racking provides safe and efficient storage for the clients increased stock levels. The forklift trucks can navigate seamlessly from the existing installation into the new, with rack end protection barriers installed to the ends of each run should the fork lift truck stray from the wire guidance mounted into the floor. Thrilled with their new storage solution, Edwards Transport have already looked to Quickline for further cost effective storage solutions in their existing warehouse space!